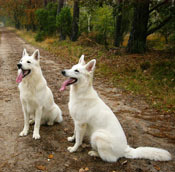 We are pleased to be able to welcome you on this site of our White Swiss Shepherd Kennel 'of Ciqala-Yuma'. Through our homepage we want to share our enthousiasm for this race and everything about it with you. Via the menu beam up here, you come into the main subjects. These main subjects have been subdivided in smaller parts, that you find via the menu beam next to each page. We hope you enjoy the virtual guided tour in our kennel. Sander Bouman, Yvonne Jager and our 'whites'.